One of the major changes the high school recruiting process has undergone in the last 10 years is that players are committing earlier; as in freshman, sophomore, and junior year in high school. But what happens if you are a late bloomer or an unconventional player? Well, many of these players are being missed right out of high school. But, instead of giving up on their dream school, they head to a 2-year junior college to refine their skills, gets lots of playtime, and keep working until they get another shot, this time as a transfer. So if you've ever wondered what junior college volleyball is really about, read on. Hello! My name is Jessi Seumalo and I’m currently a senior at Oregon State University (OSU), with a major in Human Development and Family Sciences. I would normally add that I’m an athlete as well, but some things have changed over the last few months. Unfortunately, this last fall I ended the game of volleyball at OSU that I’ve come to know and love. Volleyball was the center of my life and pretty much my identity for the past 11 years. It’s been a weird transition from “student athlete” to “normal student,” but I can definitely say I’ve learned a lot from volleyball that I’ll carry with me. 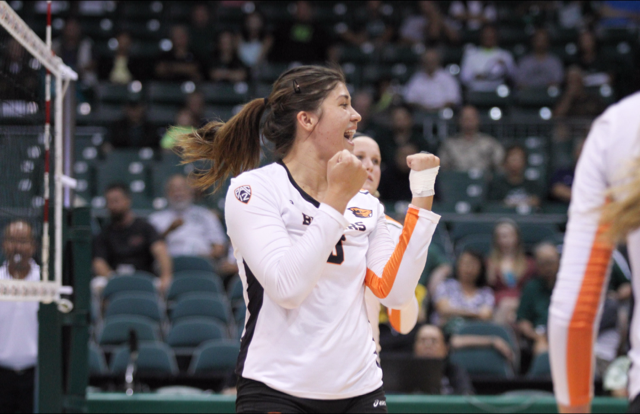 While I have learned a lot over the years from playing volleyball, I thought I’d talk about my journey of going through a junior college before OSU. I think that it’s a big possibility for athletes and should always be taken into consideration for ones that may need or want to take a different path. I think athletes tend to look at two year schools with a negative mindset, but they offer so much more than that. I can say without a doubt that going to a junior college was one of the best decisions of my life. When I was younger, I had dreamed of playing volleyball at a division one university. But not just any division one school, I wanted to be playing at one of the top conferences in the nation like the Pac-12, SEC, Big 10, Big 12, etc. While I had this dream in my mindset, my life took a turn of events that I was not expecting at all. After playing many regular seasons of volleyball and club volleyball, I finally entered my senior year of high school. It didn’t necessarily start out the way I hoped. I found myself with no commitments to any school and absolutely no idea where I wanted to go. Honestly, I did freak out a bit because I felt that I needed to have an answer at that time and have a plan all mapped out. I began to question my ability, athleticism, and overall if I was just a good enough volleyball player. It wasn’t until February of my senior year that God answered my prayers in a way I never thought imaginable. I found myself being recruited and offered a full ride scholarship to a junior college in Twin Falls, Idaho, called College of Southern Idaho (CSI). It definitely wasn’t part of my dream and I began to ignore it because it wasn’t some big fancy school. I had seen teammates and friends committing to big four-year schools and I wanted that so badly. After my parents and I discussed my options and plans for after high school, I ended up committing to CSI. In addition to these reasons, my parents were also a huge influence on me committing to CSI. Even though it wasn’t what I pictured doing after high school, they really helped me see the brighter side of it and I felt very good about my decision. Twin Falls wasn’t also my ideal town to live in but I thought, “I’m only here for 2 years and to get better at volleyball,” and went on with that. But just because I was going to CSI, didn’t mean I was going to stop reaching for my dream. I was ready more than ever and driven to improve my craft during my time there, and head towards my dream of becoming a big division one volleyball player. Before I started my freshman year there I found a quote that stuck with me. I used it as a reminder every day to know what I was there for and to keep grinding it out. Never give up on a dream because of the time it will take to accomplish it, the time will pass anyway. Two years, one regional championship, and a 3rd place at nationals later and I soon found myself getting recruited and offered a full ride scholarship to a division one university. And not just any division one school, Oregon State University who’s part of the Pac-12 conference. Getting that call was by far one of the best days of my life because I truly felt that I had made it. I’ve never felt more work being paid off than in that moment. My dream was becoming a reality and I was blessed beyond words. Flash forward to now, 4 years later and here I am no longer an athlete. It’s true what they say, it happens in a blink of an eye. My journey was not easy, short, or what at all what I had expected, but I can honestly say I would never change my journey for the world. Being a “juco product,” there’s no better feeling than grinding through those two years in order to make it to your dream. I don’t think kids should overlook a junior or community college because it’s just as important and valuable as a four-year school. It’s the same court, the same ball, same teammates fighting to win, same coaches ready to teach, and same love for the game. This path may just be a little detour along the way, but it will all be worth it as you reach your destination. I’m not saying all athletes should go to a junior college, because some can go straight into a big division one school and kill it right away. But I do believe athletes should not be afraid to do what’s best for them and never underestimate the path you need to take. Any student competing at a college of any level in a sport is grinding it out, day in and day out.